Tamron has announced two compact zoom lenses ranging from wide angle to 300mm, a 28-300mm design for full-frame dSLRs and a 16-300mm zoom for APS-C cameras. Tamron 28-300mm. A 67mm filter size and 3.8 inches long. Tamron 16-300mm. 18.x zoom for APS-C cameras. The 28-300mm zoom, developed for full-frame dSLRs, uses 19 elements in 15 groups with a minimum focusing distance of 19.3 inches. With a 67mm filter size, the 3.8-inch long lens has a maximum aperture of f3.5-6.3 and weighs 19 ounces. The 16-300mm zoom provides an 18.8x zoom ratio for APS-C cameras using 16 elements in 12 groups with a minimum focusing distance of 15.3 inches. With a 67mm filter size, the 3.9-inch long lens has a maximum aperture of f3.5-6.3 and weighs 19 ounces. Dimensions aren't the only thing the lenses have in common. Both include Tamron's Piezo Drive standing-wave ultrasonic motor system and ceramic ball bearing Vibration Reduction technologies. Prices and availability were not announced but other details are in the news releases below. Innovative All-In-One zoom integrates state-of-the-art optical design, Piezo Drive and Tamron's exclusive Vibration Compensation system to achieve superb image quality in a remarkably compact, lightweight package. SAITAMA, Japan -- Tamron Co., Ltd. has announced the development of 28-300mm f3.5-6.3 Di VC PZD (Model A010), an advanced new All-In-One zoom lens for full-frame dSLR cameras. The lens sample will be on display at the Tamron booth at the CP+ 2014, which will be held from Feb. 13 to 16 in Yokohama, Japan. 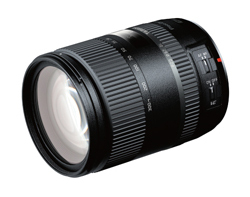 Since the launch in 1992 of the 28-200mm (Model 71D) high-power zoom lens -- which featured a revolutionary compact, lightweight design -- Tamron has been continually expanding its portfolio of world class optics to benefit consumers. Having revolutionized the optical design of the previous 28-300mm (Model A20), Tamron is developing a powerful new, high-power zoom lens for full-frame dSLR cameras that enhances image quality and incorporates the PZD (Piezo Drive) -- a standing-wave ultrasonic motor system optimized for swift, quiet AF -- and the acclaimed VC (Vibration Compensation) mechanism in an amazingly compact configuration. Featuring a new, sophisticated external finish, this lens complements the performance and style of full-frame dSLRs, while delivering the practical advantages of an All-In-One zoom lens. State-of-the-art optical design technology delivers superior image quality. The advanced optical construction of this lens includes four elements of LD (Low Dispersion) glass, three Molded-Glass Aspherical elements, one Hybrid Aspherical element, one XR (Extra Refractive Index) glass element and one element of UXR (Ultra-Extra Refractive Index) glass, which has greater refractive index than XR. The full use of specialized glass elements in its design contributes to making this outstanding lens as compact and lightweight as possible, while minimizing aberrations, resulting in superior image quality. Particularly impressive is the thorough compensation of chromatic aberrations at the telephoto end, yielding images of enhanced clarity and crispness. Focus on portability -- The lens is now even smaller and lighter. In addition to state-of-the-art optical design that facilitates downsizing of the lens body, the mechanical design, which incorporates a highly sophisticated multi-stack-cam layout that takes up far less space and PZD (Piezo Drive), an autofocus drive system with a simpler, more compact structure, has made it possible to reduce the overall dimensions of this lens compared to the existing Tamron 28-300mm (Model A20). These technologies are the fruit of Tamron's more than 20 years of research and development in the high-power zoom lens field. The latest optical technology has been used to provide an expanded zoom range (compared to the B008) at both the wide-angle and telephoto ends, without necessitating the use of an oversized lens body. By employing UXR glass (which helps to reduce the size of the front lens diameter), an optimized layout of the Molded-Glass Aspherical elements and adopting a 5-lens-group zoom system approach to provide enhanced design flexibility, the new lens embodies the fusion of state-of-the-art optical design, sophisticated mechanical design and high-precision lens manufacturing technology, thereby attaining a compact size, an unprecedented zoom range and superior image quality. Upgraded cosmetic design -- Elegant tungsten silver brand ring. Tamron has upgraded the cosmetic design and finish of this lens to create a more sophisticated, high-end look in keeping with the demands of discerning full-frame dSLR users. Employing a sophisticated linear pattern rubber grip on the zoom and focus rings and an elegant tungsten silver name-brand ring, this newly designed model accentuates its visceral presence with understated elegance and class. PZD (Piezo Drive) delivers faster, quieter autofocus action. The PZD (Piezo Drive), a standing-wave ultrasonic motor system, delivers faster, quieter, more precise action when the autofocus is engaged. The full-time manual focus system is easy and intuitive, enabling quick and convenient manual focus at any time. Tamron's acclaimed VC (Vibration Compensation) mechanism reduces image blur caused by camera shake to deliver significantly sharper images even when shooting handheld. Using a circular diaphragm(3), this lens achieves spectacular background blur effects that enable creative use of depth of field. Moisture-resistant construction for worry-free outdoor shooting. Moisture-resistant construction helps prevent moisture from penetrating the lens. A high-performance, high-power zoom lens that delivers focal lengths extending from an unprecedented 16mm at the wide-angle end up to a long-range telephoto 300mm! Incorporates Piezo Drive and Tamron's exclusive Vibration Compensation system to further enhance the real-world performance of this next-generation "all-around lens," which makes taking photographs more convenient and enjoyable. SAITAMA, Japan. -- Tamron Co., Ltd. has announced the development of an advanced new All-In-One zoom lens, designed exclusively for dSLRs with APS-C size image sensors, that provides an amazing 18.8x zoom ratio. The lens sample will be on display at the Tamron booth at the CP+ 2014, which will be held from Feb. 13 to 16 in Yokohama, Japan. 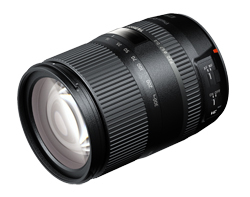 Since the launch in 1992 of the 28-200mm (Model 71D) high-power zoom lens -- which featured a revolutionary compact, lightweight design -- Tamron has been continually expanding its portfolio of world-class optics to benefit consumers. Tamron previously launched an 18-270mm (Model B008) All-In-One zoom lens exclusively for dSLR cameras with APS-C size image sensors that features a 15x zoom ratio, superior image quality, swift, quiet AF and Tamron's acclaimed VC (Vibration Compensation) mechanism, in an ultra-compact package. This ground-breaking lens has won major plaudits throughout the world. Responding to consumers' demand for expanded focal lengths both at the wide-angle end of the zoom range and the telephoto end, Tamron has begun development of a completely new All-In-One zoom lens design that provides an impressive focal length range extending from 16mm true wide-angle to 300mm super-telephoto. A further expansion of the imaging range with a minimum focal length of 16mm (35mm film equivalent: 24.8mm) at the wide-angle end of the zoom range and a maximum focal length of 300mm (35mm film equivalent: 465mm), this remarkable new lens provides the world's first zoom ratio of approximately 18.8x. Responding to requests from consumers who wanted to be able to photograph subjects with a wider viewing angle than is possible with conventional high-power zoom lenses, Tamron has begun developing a unique lens with a minimum focal length of 16mm. At the telephoto end, the maximum focal length has been increased to an impressive 300mm. Users of this new lens can enjoy unprecedented framing flexibility by easily adjusting the angle of view using the convenient zoom ring. The lens construction features 16 elements in 12 groups. This includes three Molded-Glass Aspherical elements, one Hybrid Aspherical element, two LD (Low Dispersion) elements, one XR (Extra Refractive index) glass element and one element of UXR (Ultra-Extra Refractive Index) glass, which has a greater refractive index than XR. The full use of specialized glass elements in the design contributes to thorough compensation of optical aberrations. In addition, the use of the latest coating technology for suppressing reflections on lens element surfaces minimizes unwanted flare and ghosting and assures sharp, crisp, high-contrast images. Using a new design approach to create an ultra-compact lens. A minimum focusing distance of just 15.3 inches supports an extensive range of macro photography capabilities. The new lens provides a minimum focus distance of 15.3 inches over the entire zoom range, with a maximum magnification ratio of 1:2.9. This makes it possible to get right up close to the subject of the photo to enjoy easy, stress-free macro photography. The PZD (Piezo Drive) advanced standing-wave ultrasonic motor system delivers faster, quieter, more precise AF action when the autofocus is engaged. There is enhanced support for contrast-detection AF capabilities and focusing when in live-view mode has been made smoother. The new lens also features full-time manual focus, a function that was not provided on the B008, making manual focusing more convenient. Tamron's acclaimed VC mechanism is incorporated into the new lens. VC reduces image blur caused by camera shake to deliver significantly sharper images even when shooting handheld at long telephoto settings. Tamron has upgraded the cosmetic design and finish of this lens to create a more sophisticated, high-end look in keeping with the demands of discerning dSLR users. Employing a sophisticated linear pattern rubber grip on the zoom and focus rings and an elegant tungsten-silver name-brand ring, etc., this newly designed model accentuates its visceral presence with understated elegance and class.